For over six centuries, firearms have contributed to a range of narratives in international history. From finely chiseled steel to intricate wood carving, the antique firearms in Art of the Hunt embody an accessible 16th, 17th and 18th century decorative art. 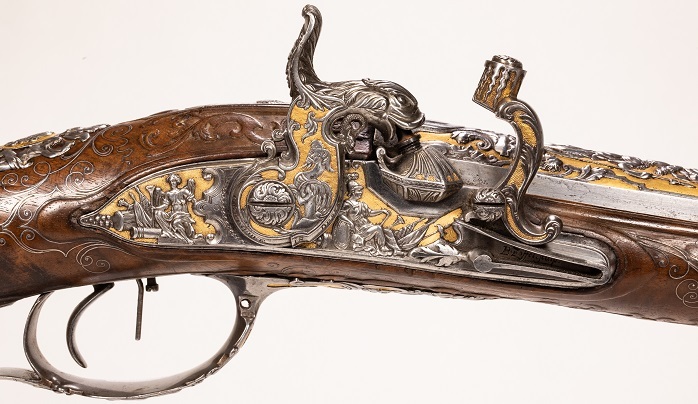 Despite being an integral part of European culture, the art of gunmaking is often overlooked in favor of traditional styles of art from the period. This exhibition will shine a spotlight on this part of European hunting life with a look at the many ways that sporting arms, as functional and decorative art, impacted the lives of artisans and their patrons. Explore the decorative art of firearms at a time when the technology was still relatively new. Throughout this exhibition, we invite visitors to journey through three centuries of firearms design and sport to learn not only about the guns themselves, but to place themselves in the lives of their artists and gunsmiths. Organized by the Houston Museum of Natural Science in collaboration with the Museo Stibbert, Florence, Italy and Contemporanea Progetti.